I had a lot of ideas in my head and i just couldnt wait to get out of the bed and get to my blog.. coz it has been days i had not been able to share a thought or two.. even though i was bursting with some.. but this is the thing i love most abt blogging.. once you are in this cyberspace.. there is so much more.. that i fall short and overwhelmed.. :)..
anyways.. here is what she tells us abt her decorating the walls venture..
and then there is no dearth of creative readers on this globe.. i mean chk out the creative ideas that flew in response to this article.. they are masterpieces in themselves.. I took photos of random city structures…old abandoned factories, 1950s abandoned gas stations, rail cars from linear perspectives…you get the idea- in black in white with my regular consumer digital camera. I then printed them out on photo paper 8×10 from my computer, framed them and hung em up. Viola! Instant art. Im no pro photographer or artist, but it looks pretty darn cool and was dirt cheap. 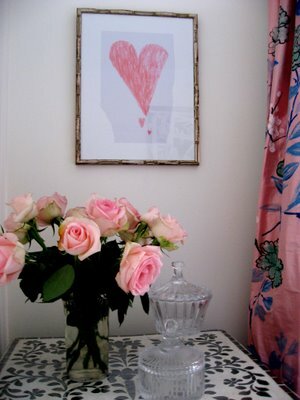 I matte and frame my kids art work from over the years and many people think some of the abstract or flowers in vase are adult works of art. Many adult works of art do look like a child could do them. My kids are proud to see their work displayed and it’s a little different than just putting their art on a fridge door! Magazine covers such as Time or Rolling Stones (just to name a few) make great quick art for your walls. Print and put them in a frame instant art. My daughter did this in her living room found some nice covers and framed them in a set of four black frames and it looks smashing. 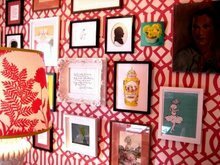 There’s no need to go out and drop a fortune to accessorize the walls in your home. With a little creativity, you can repurpose a variety of things in your house and have wonderfully unique wall art without spending a dime. Feng Shui, an ancient Chinese art of living, has recently come into vogue for offices and homes all over the modern world. For those trying to put more Feng Shui into their personal space, here is a quick guide to the many decorations and purchase options following the trends of this Chinese art. Are you looking for some interior decorating ideas that won’t break your budget? If so, you will be happy to know that there are plenty of changes you can make in your small space that will help spruce it up without hurting your pocketbook. I recently moved from one state to another. I left most of my belongings in storage, including some original artwork. So to get me through the phase of not having anything on my walls etc, I started out small. First I took my most colorful jewelry, such as necklaces with dangling earrings and hung them on the walls of different rooms with either a swatch of fabric from a yard sale, or to be coupled by some scarves I brought along. Next I found things from the outdoors such as Bittersweet vine, seashells and other beachy finds. I frequented places like The Christmas Tree shop, after 5pm where there is a table of 90% off items. Bought some rope from the hardware store. I now have a beautiful canopy over my bed for $6.00 and a foyer full length mirror edged in shells, sea glass and the like, (which was made out of a mirrored shower door I got for $1 at a yard sale…you would never know it unless I told you). I bought discounted quilts ($1.50 new for each..truth) and hung on the larger walls with corsage pins from a flea market that I found for $1. Fabric swags also with inexpensive blinds, hang on the windows. Also did some extra long swags in the living room, kitchen, hung from ceiling. Everyone that enters my small cottage is absolutely amazed and full of compliments. Oh, one last thing. I bought two canvases for a total of $3.50 from yard sales which I painted a sunrise over the ocean…which anyone can do…LOL…:) I got the craft paint from a “free box” at my place of work. Years ago when I was raising children, I “borrowed” artwork from our local library. So you might think of this as well for an option. It gives you a chance to enjoy some nice pieces, without the worry of getting tired of it because, in 6 weeks, you get to return it and borrow something else. Why, when faced with budget decisions, is art always the first to go? I know things are tight but I am a full time artist and find it hard to believe that with all the great art out there, that there isn’t something to fit every budget. 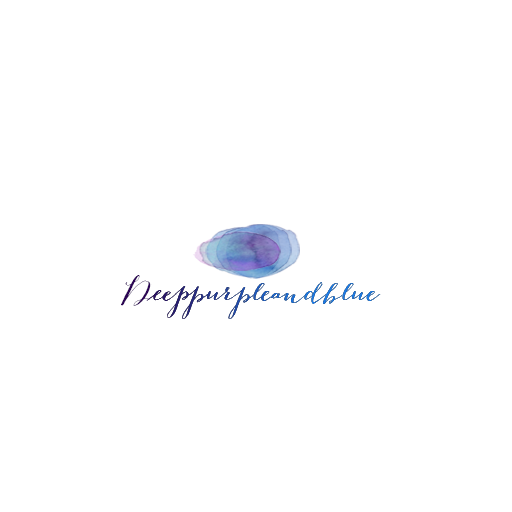 Visit online shops like Etsy or The Artful Home (just to name two), plus there are tons of websites by artists who, like everyone out there, are trying to make a living in this economy. You could even get a group of friends together and head to your local art fair this summer; it’s always a great place to find fab art at affordable prices. Also, seek out your local artists! buy locally and save on shipping – who knows, you might even get a deal!Here’s one suggestion for filling a space:When thinking about purchasing art, think about your space and consider that you’ll likely move at some point. 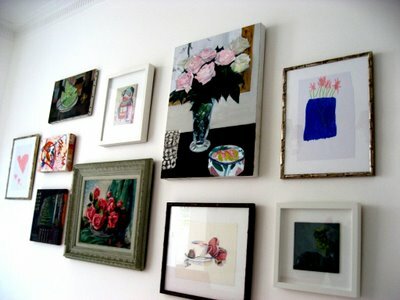 You may have a big wall to fill, but really a grouping of smaller pieces (by the same or various artists) would do the trick. They’re flexible to display and move around, creating a different mood in each space. Plus, it would likely be more affordable than a larger piece and it’s fun to mix and match styles and sizes, creating your own flair. We all really need to support each other in tough times, so do a little art search, you’ll be surprised at what you find! We recently decorated a guest bedroom in a nostalgic, vintage theme. We ebayed comic books, paper dolls and children’s puzzles from the 40’s and 50’s and hung them in Thrift Store frames. We added some shelving featuring vintage toys from our childhoods and voila!! Our guests have all said that our guest room is like a little museum. The grandkids LOVE it. Inexpensive (comic books are as little as $4.00 each, frames a dollar or two) and a fun little project that engaged both of us. I am new to posting on this site and am unsure of the regulations. I would like every one to know about the type of work that I do. I do Vevetian Plaster and Custom Art Panels. By custom art panels, I mean that you can take a wall of any size, and decide what sizes,colors, shapes, and textures you would like, and create a set of artistic panels. You can go to http://www.youtube.com/ and search Unique Interior Design to see what I am talking about. Any comments would be greatly appreciated. This autobiographical tale is my personal favorite. In a compelling narrative, the architect and scholar describes how he started out to build a boat shed and ended up with a new home. Along the way, Rybczynski sweeps through 2,000 years of architectural history, hopping from ancient Greece to Renaissance Italy to 20th century America. Kitchen Trends For 2009 Thinking about going for a brand new look for your kitchen this year? We’ve been trend spotting to find the latest looks for 2009.Find out more on the latest kitchen trends for 2009.